According to UNESCO, the “oral and intangible heritage of humanity”, is comprised of simple ingredients, such as pasta, bread, legumes, olive oil, fish, fruits and vegetables and very little meat. Credit for deriving the specific properties of this dietary regimen goes to a US biologist and physiologist: Ancel Keys. During his stay in Italy, Ancel Keys participated in the first conference on nutrition which was held in Rome in the early 1950s. IT was during this event that he realized how areas in the Cilento region were less affected by cardiovascular disease than in his home country. What followed were several epidemiological studies after his return to the USA. One in particular was the famous “Seven Countries Study”, the first large epidemiological study in which mortality from cardiovascular causes was correlated to eating habits. Started in the late 1950s, this study evaluated 12,763 males and female, aged between 40 and 59 years, who hailed from 7 different countries (Italy, Greece, former Yugoslavia, Holland, USA, Japan, Finland). Analysis of the data showed a higher cardiovascular mortality rate in people who consumed greater amounts of fats derived from milk and meat, alcoholic beverages such as beer and hard liquor, butter and pastries, dairy products, and other animal products. However, evidence showed that in rural Mediterranean areas, where a diet rich in fruits, vegetables, legumes, olive oil, fish, and cereals prevailed, there was a net decrease in mortality from cardiovascular causes. The gradient in mortality rates between the Mediterranean and non-Mediterranean European zone was 655 vs 284 per 10,000 persons after 15 years of study, and 1947 vs 978 per 10,000 persons after 25 years of study. Italy participated in the study via three rural areas which were chosen to represent the different nutritional norms of the country: Nicotera in Calabria, Emilia Romagna Crevalcore, and Montegiorgio in the Marche. In these areas the daily food intake was represented by abundant plant foods (50-60% grains, 3% fruit, 3% vegetables, 3-6% legumes, potatoes, nuts, and seeds) which were always fresh, locally sourced, and the organic. The main source of fat was olive oil. Dairy products were consumed daily but in small quantities, eggs between 1 to 4 times a week, fish and poultry were consumed in moderate amounts, and red meat in modest quantities. This type of diet has a low content of saturated fat and an overall total fat content which does not exceed 35%. The diet did not exceed 2,000 calories per day for women and 2500 daily for men. 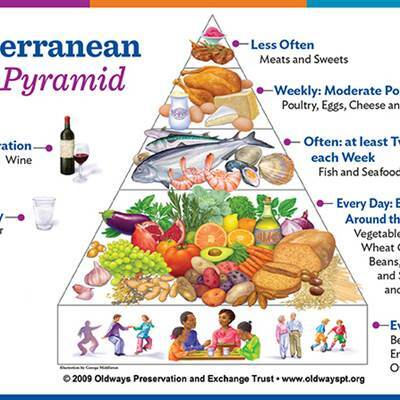 Based on this study, and others which followed, the so-called “Universal Pyramid of the Mediterranean Diet” was formulated. The food pyramid is designed as follows: at the base there are carbohydrates (ie energy without fat), consisting of cereals and potatoes, which are recommended for daily consumption. Going up to the apex of the pyramid are the different types of fruits and vegetables with a recommended consumption of 2 to 3 servings per day. 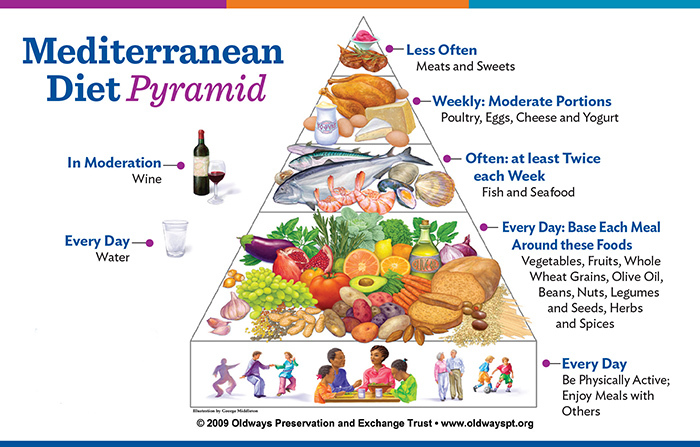 At the center of the pyramid there are foods like animal products, including meat, fish, and cheese, which have a regular recommended consumption of only a few times per week with eggs and red meat being consumed even more sparingly. At the top of the pyramid is sugar, wine, animal fats, and sauces, all of which are to be consumed in extreme moderation. In regards to food portion size, the Mediterranean diet requires a daily intake made-up of 50-60% carbohydrates (of which 80% are complex carbohydrates and 20% are simple sugars such as sweets), 10-15% protein, and 25-30% fats, such as olive oil. Fruits and vegetables are designed to be consumed freely due to the essential vitamins, minerals and antioxidants they provide to the human body. In addition to a well-executed Mediterranean diet, it is always advisable to constantly engage in physical activity and avoid smoking. A study conducted in tandem with the Seven Country Study revealed that those subjects who did not follow a Mediterranean diet, remained sedentary, and continued smoking had a life expectancy of 4.8 years less at 20 years old and then 10.7 years less at 40 years old compared with those who followed a Mediterranean diet, were nonsmokers, and engaged in regular physical activity.